Placed at the centre of our school, between Foundation Stage and KS1 and KS2, sits Holy Trinity church. An act of collective worship takes place on a daily basis through assemblies. 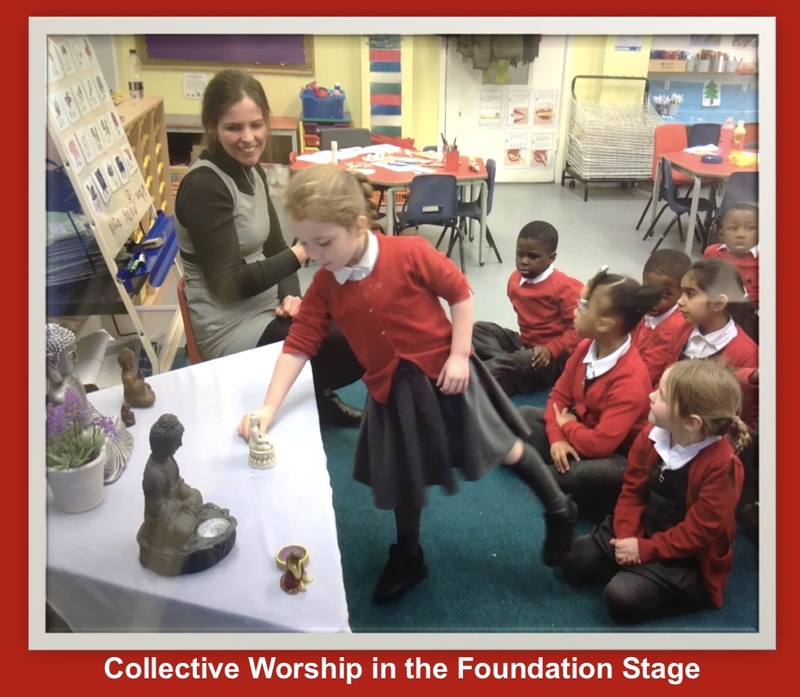 Roz Solanke (our former RE governor and now consultant RE advisor) comes into the Foundation Stage on a weekly basis to deliver a multi-faith story session to the children. The children learn about the stories and characters from Christianity, Judaism, Islam, Buddhism and Sikhism, and have a time of prayer and singing during each session. 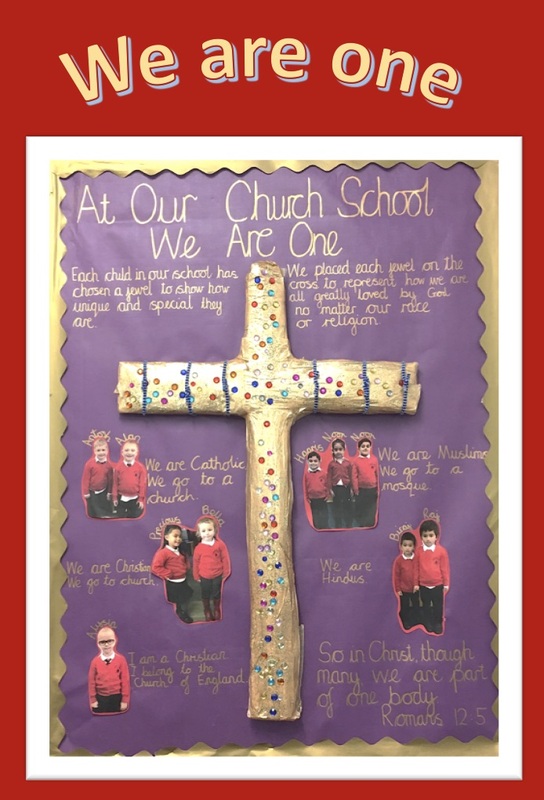 The Nursery and Reception classes deliver their RE lessons on a weekly basis in a collective worship format, including a time of prayer, a song and a time of reflection during the lesson. Each day the Foundation Stage children say the lunch time and home time prayers. A Christian value is taught by a member of the SMT, and wherever possible linked to the British Values. Children are encouraged to read scripture from the Bible to reinforce the value, and nominate their classmates for a value award for demonstrating this value in their lives. Each week a child volunteers to say a prayer based on the value taught, and the prayer is written in our values assembly prayer book. The children learn and sing Christian songs and Hymns. A time of prayer is always included at the close of this assembly. The whole school gathers for a time of worship and teaching in Holy Trinity Church. The services are led by Reverend McKinney (the vicar of Holy Trinity and our RCS RE governor) and other local pastors. Each week a prayer warrior (any child can volunteer for this) is encouraged to say a prayer based on the teaching delivered that day. The children gather together in their key stages and the class teachers take it in turns to deliver an assembly provided by the RE coordinator to their key stage. The majority of these assemblies are Christian based, with some assemblies of main festivals and celebrations of other faiths delivered when relevant to the calendar eg Eid. A time of prayer and reflection is included in these assemblies. KS1 and KS2 gather in the hall to celebrate the children’s achievements. The assembly is delivered by a member of the SMT. A song, prayer and time of reflection are included in this assembly. Prayer is an important part of our collective worship every day. All the children learn the Lord’s Prayer off by heart. The children are taught how to pray and plenty of opportunities are provided for the children to lead the school in prayer in their classrooms, collective worship times and during our special school services. Each class also says a short class prayer twice each day; once at lunch time and once before going home. These can be standard prayers, or the children can make up their own prayer. We feel this helps the children to perceive God as an integral part of their everyday life. Many classes have their own prayer book filled with prayers the children have written, which they may choose to pray from. Throughout the school, you will see RE displays, made distinctive through their purple background with gold borders.